I said I’d be honest on this blog and today is just such a post. Last week, a sweet friend of mine said, ” You are officially one of those moms that makes me question my ability to fully parent and live well/completely.” I wasn’t exactly sure what to do with that comment, but I think I know, now. It’s time to be honest! Last week wasn’t good. Olive got sick on Tuesday with her first stomach bug in her little year on this earth. It wrecked her appetite, needless to say, and she subsisted for the rest of the week on mostly bananas, bits of bread, small bites of chicken and forced bites of a few benign vegetables like carrots and…carrots. My little super-eater turned into the “picky eater” kid and even today, isn’t back at full steam. She plays fine, acts fine, but when it comes to eating – it’s a fight. I tried my best to stay the course; don’t force her, don’t get stressed, if she doesn’t eat much at lunch, she’ll catch up at dinner – but I was fearful all week that this stomach bug would make her afraid of food, of eating, of trying new things and in one week, all would be lost. You think I’m exaggerating for the sake of this blog. I wish I was. I guess, today, my confession is that I try too dadgum hard to make things go perfectly, and when they don’t, I feel like an utter failure. Perhaps this isn’t the day to write because last night I slept maybe three hours (my inability to turn my brain off and relax) but I thought about my friend’s comment on my status, and I just wanted to tell her that we only show our best online. We only write statuses we are either proud of or find ironically funny. So no one heard all week how scared I was that Olive was sick, or how miserable I felt when she wouldn’t eat a bite all day for a couple days in a row. And of course I didn’t write statuses about how I got angry with her and made her cry because she kept dropping food off the side of the high chair. I don’t like writing about that part of life. The hard part. The part that makes you question if you’re doing everything wrong and will, inevitably, scar your child when it’s all said and done. I thought, “How much would everyone love if Olive ended up hating a variety of food just because I want her to love food so much?” And it’s sad, but I really do feel that most of the people I know would secretly laugh if that happened. And I can’t say that I blame them. I’m very passionate about cooking and food and banning “kid-food” and teaching children to eat well and have manners at the table. I wouldn’t say that I have much camaraderie in that area, at least not locally. Or maybe I just don’t feel it because I’m not admitting to the hard parts that happen, as well. I’m only telling you that she ate baby bok choy with fish sauce vinaigrette last week and loved it. Not that she cried big, fat tears today because I wouldn’t let her hold a fork while she ate (she’d just throw it or poke herself in the face). Sigh. Our hard week came to a head this morning as Olive had her one year check up and got 5 shots in her little legs. So, I made a soup for her for lunch. Cream of celery, and I pureed the heck out of it so that there’d be no chunks. I just didn’t feel like challenging her today. She ate fine. Not as much as last week, but enough. And I will continue to do what I know in my heart to be best. Let her be a person with feelings and a new found opinion on things, and try not to force her to like something just because I do. She’ll come around. And if today, she only wants the texture of soups and yogurt, then that’s fine. Maybe tomorrow she’ll eat something more challenging. The point, I think, is to get back to the heart of what makes food and cooking beautiful: it’s something to be shared. Eating, first, should be enjoyable. Not nutritious, not organic – but delicious. Good for the soul. Shared with family and friends. Happy. Stress-free. Not another lesson to pass or fail. I vow to back off in my intensity for success at having a “good eater” a bit and get back to what makes food so amazing. It’s good. 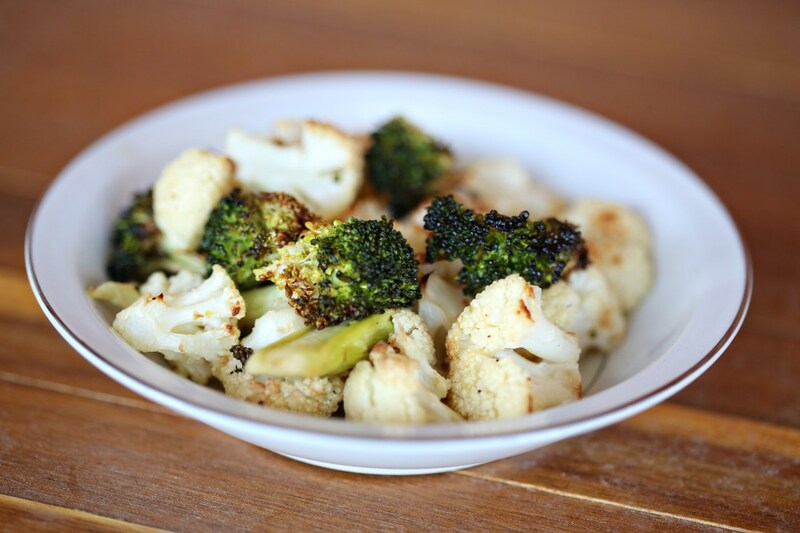 An incredible way to enjoy a couple of vegetables that might not be everyone’s favorite is first: roast them till they’re a little crispy. And second: toss them in a vinaigrette! In today’s recipe, that vinaigrette is one that contains fish sauce and it’s incredible. I know you wouldn’t typically put “fish sauce” and “incredible” in the same sentence, but you’ll start to once you try this. Also, it’s from David Chang’s genius book, Momofuku, and I’m pretty sure he’s never made anything bad in his life. It’s so simple and the vinaigrette recipe makes a lot, so you can save it in your fridge to toss with pretty much any roasted vegetable. The original recipe called to toss it with roasted brussels sprouts, which is a vegetable most think they don’t like. But I’m pretty convinced you’re always just one recipe away from liking something you thought you never would. So! Try this today and let me know what you think. Fish sauce can be found in most Asian sections of supermarkets near all the soy sauce, but if you have trouble, you can definitely find it at any Asian mart in town. Preheat oven to 400F. 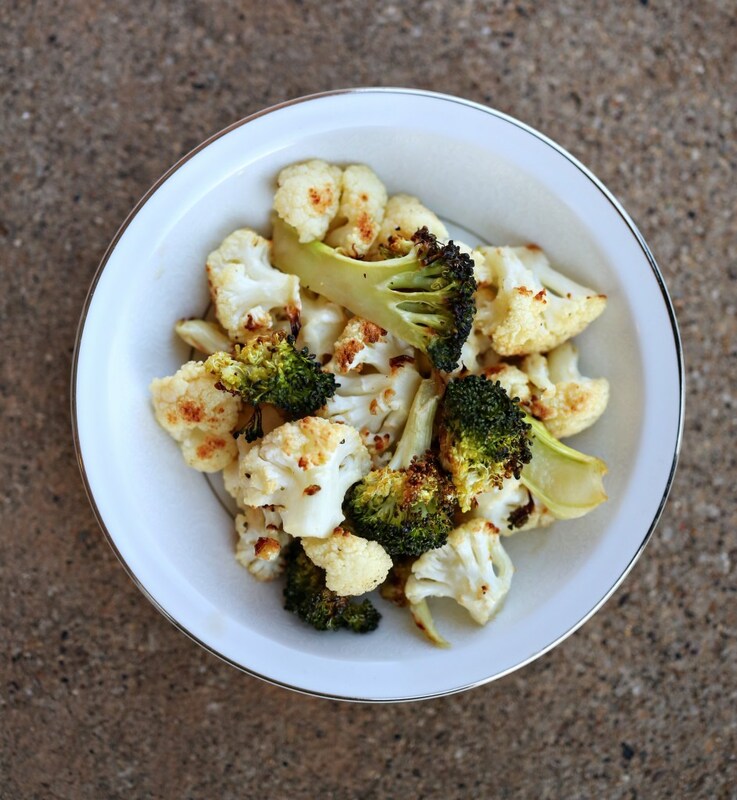 Cut up the broccoli and cauliflower into small, bite sized pieces. I trim the “trees” in half so that they roast better. You want to aim to make the size of your vegetables all nearly the same so they cook at the same rate. Toss in a couple tablespoons of olive oil and spread out on a large rimmed baking sheet. Don’t crowd the pan. Put it on two pans if you need to. Sprinkle with salt and pepper and roast for about 20 minutes, or until they start to get kinda crispy and browned on the edges like in the photo above. When they’re done, toss in a large bowl with the vinaigrette and serve immediately. For some reason, broccoli gets cold faster than any other vegetable known to man. Combine everything in a large mason jar with a tight fitting lid. Or any container with a tight fitting lid that won’t leak. Shake it all around until the sugar dissolves. Keep in the fridge for up to a week.